On the flip side, there have always been concerns about over-exertion and too-intense training for children, so some families may be wary of starting down this road (pun intended), even though they are interested in this family-friendly activity. 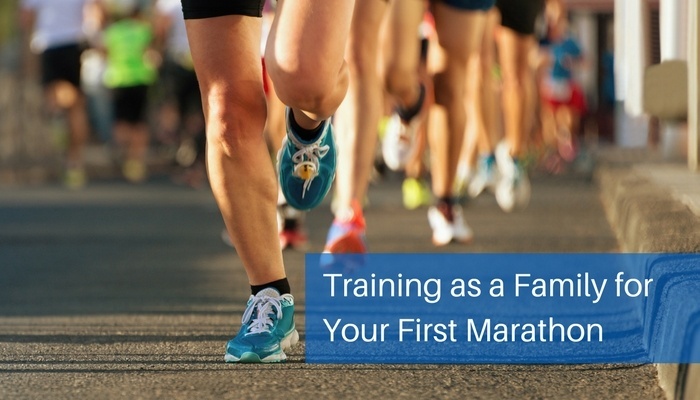 Let’s dispel some of the myths and discuss some of the finer points of training for a marathon with children. Training is too physically hard for kids and they can suffer serious injuries. TRUTH: When parents and coaches make running a fun sport, and ensure kids are training properly, this is simply not true. While kids do have different physiology—they are not merely small adults---and are more prone to injuries while their bodies are still growing. However, they can learn to regulate their own physical needs under the guidance of knowledgeable adults. The pressure is too hard on kids. TRUTH: Running a race of any length doesn’t have to be about intense competition. Consider starting out slowly, making your first few races “just for fun,” and build a love for the sport. Remember that children have an innate desire to emulate parents, so if you are a competitive runner, you need to modify that focus for your children, so they aren’t placing the same pressure on themselves too soon. Kids will be burned out on running, killing the long-term joy of exercise. TRUTH: Kids often want to do any physical activity which involves their parents, so if you like to run, they will likely want to run (with you)! Be a good role model when it comes to training. If you design a running regimen which involves other activities (like most training programs), they are less likely to become bored. Preparing for a marathon takes time, so easing into it slowly will help you and your kids reach your goals, whether it be to finish towards the top or simply finish. A 6-week plan usually gives you enough time to be prepared for your first event. Sit down with your kids and plan together how you want to schedule your workouts. Kids who are involved in planning are usually more invested in the activity and long-term goal. Alternate walking and jogging at first, no more than twice a week. You need to build cardiovascular strength, and by focusing on distance rather than speed, your allow your body to become fit over time. Additionally, by running slower for a longer distance, your red blood cell count increases along with the strength of your heart. It is not just your legs which need to be prepared for your first marathon; your respiratory system should be trained as well. Consider adding the PowerLung respiratory muscle training device to your training regimen to increase your vital capacity, reduce windedness and improve recovery times. By the second or third week, build your jogging up to running, while still alternate with walking. This allows your body to experience bursts of recovery time between the runs, increasing your cardiovascular and respiratory strength. Make sure you and your kids have the correct shoe for running---the wrong shoe can have a big (negative) effect on your ability to run efficiently. Don’t forget to ask your children periodically about their feet; they are still growing and will likely need to replace their shoes more frequently. Add strength training to your routine in the 3rd week. Push-ups, planks, squats, and burpees will provide your muscles with additional strength and varying movements. If at any time your kids balk at the idea of running, take a break and focus on something different, like adding some obstacles to your routine which emphasize strength. If either you or the kids start experiencing pain, STOP. Consider what is happening and re-evaluate your methods. Adults know to listen to their bodies taking breaks when they become sore. However, kids may not understand the source of pain; ask them directive questions to determine how and why they are sore. No matter what your activity entails, always stretch before and after you exercise. Kids are more likely to get dehydrated and may not recognize the common signs. Make water breaks a part of your training routine. Not only will you stay hydrated, but you may transform kids into water drinkers when they may have been fixated on sugary drinks. We all get bored and our bodies get worn out from the repetitive movement. Take a break and do something different, like swimming, playing some basketball, or just an afternoon at the playground. A mental break is well-deserved in the middle of an intense training program. Color Run. These races are held all over the country, so you won’t have to look far for the opportunity to race and enjoy the experience, including music and a LOT of color! Kids Obstacle Challenge. Meant specifically for the kiddos, this fun event combines running with obstacles, which make it a match made in heaven for youngsters; and since parents can run with them for free, its affordable entertainment! Mermaid Series. This women-only event offers girls and ladies an opportunity to show off “Girl Power” in this combination of 5k, 10k, and girls’ 1.5-mile mermaid dash. Offered in 7 cities in the western US, some locations feature triathlon and duathlon options as well. Whether you train for marathons or simply enjoy spending time together as a family in fitness-related activities, an exercise routine helps to promote healthy living to your children. The time you spend planning and working towards a goal teaches your children preparation, discipline, goal-setting, and perseverance, along with the reward of achievement and creating healthy habits. The benefits of physical and respiratory training are lifelong rewards! For more valuable information about running, visit our Better Breathing blog.